Dr. Suzanne Sisley, MD entered a thriving private practice 8 years ago, joining forces with her mother, Hanna Sisley, MD, a family practice physician in the inner city of Phoenix. They are reportedly the only mother-daughter MD-physician team in the Phoenix area. 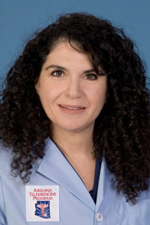 In addition to her duties at her private office, Sue also serves as Clinical Faculty at St. Joseph’s Hospital and Medical Center at the MercyCare Adult Medicine Clinic for indigent patients in Phoenix, AZ. Sue also spends 2 days per week at a homeless clinic caring for Seriously Mentally Ill patients. Sue graduated from Northern Arizona University with a degree in Chemistry/Pre-Med and a minor in Theater. She proceeded to Tucson where she completed her medical degree at the University of Arizona College of Medicine. In 2000, Dr. Sisley completed her five-year Residency Training at Good Samaritan Regional Medical Center in the fields of Internal Medicine and Psychiatry. Dr. Sisley works closley with Dr. Schwager as “co-therapist” in their atypical psychophamacology telemedicine cliniic, as a part of the Arizona Telemedicine Program. Both Drs. Sisley and Schwager operate a totally telemedicine based Suboxone treatment program for patients with opoid dependence.